Another inconvenient web posting "disappeared" | Watts Up With That? Another inconvenient web posting "disappeared"
The last link is particularly important, given that it shows, among other things, that those dismissing human-driven global warming tend to have a more accurate picture of the basic science than those alarmed by it. 10:46 p.m. | Updated I’ve removed a line I’d tacked on here that gave too simplistic a summary of the Six Amercias [sic] study. …this study also found that for some knowledge questions the Doubtful and Dissmissive [skeptics of man-made global warming] have as good an understanding, and in some cases better, than the Alarmed and Concerned. see the report for specific examples. I’ll add that Mr. Revkin has always been fair with me, but surely he must have known that this would be noticed, particularly when it paints skeptics in a positive light? This is the problem I have with “online” journalism. The content can be changed, deleted, embellished, long after it was first “published”. Historians will not be able to trust our current archives because they get changed. I have seen cases where the Washington Post has edited content months after stories were originally published. You can’t “unpublish” ink on paper and “online” content is worth exactly as much as the paper on which it is printed. Revkin’s generally OK. Leave him alone, he’s probably becoming a skeptic himself. He gives a fair go to WUWT and CA as a warmista. That my view anyway…..
Poor Andy every now and then he accidently tells the truth.The rest of the time its the mantra of the smug, we need to educate the public. I wonder as to the relevance of the cranial vacuum caused by a modern university education.Without getting too cynical I’m looking for the term for educated beyond ones intelligence, or the astounding arrogance common to highly papered experts who lack all common sense. Crosspatch, what is more accurate? The Internet or the Bible? If you click through to the report it’s interesting to see that those classified as most concerned about AGW (called Alarmed in the report) are the least knowledgeable about AGW. For example, 24% of the Alarmed think the greenhouse effect refers to the hole in the ozone layer. I think Andy Revkin by evidence of many of his posts…is a luke-warmer. He may be skeptical of us, but I think he really wants good science. But now he betrayeth himself again (because he needs to keep his job) with a retracted statement….of a previously accurate assessment. Groupthink is alive and well. Big Brother “Science” is alive and well. The pressure of the NYT Establishment is alive and well. Come on, Andy! Don’t give in to the pressure of The Man. What if…The Man…is complete wrong?? Changes the equation, doesn’t it? And down the memory hole it goes! hey, i heard an ol’ familiar voice on the radio just now and its Anthony Watts on the Lars Larson show on KXL out of Portland, OR iirc….Great job Anthony! I was afraid for a moment that Charlie Manson knew more about climate than me. The question isn’t about accuracy. The question is about saying one thing and then making it appear as if something completely different was said later. It would be a completely different matter if the media outlet published the change as an errata or update, but to edit the original with no indication anywhere that a change or deletion or addition has been made is dishonest. We have seen many cases where “inconvenient” reporting has been flushed down the memory hole when it didn’t fit the narriative. If today’s position looks poorly chosen by yesterday’s information, you remove that information and anything that contradicts today’s position. It is what the Soviets would do. One recent example was where the NYT published an article that said the current administration’s economic policies had failed. That article lived online for about two hours before the paragraph was reworded. That lived for about another hour or two before the paragraph was completely deleted. It was almost as if the White House called the NYT and asked “whose side are you on?” and the NYT was reminded whose “side” they were supposed to be on. There shouldn’t be a “side”. It should be what it is. But time and time again we see media outlets editing yesterday’s news when it no longer fits today’s reality. The Bible contains a set of inaccuracies (x). The Internet makes available a set of inaccuracies (y). The set of inaccuracies available through the internet (x) includes the set of biblical inaccuracies (y). If x contains y then x can never be more accurate than y. Since x also contains “50 million climate refugees in 2010” then the set of x is at least one larger than the set of y. The Bible therefore contains less inaccuracies then the Internet. I like Andrew Revkin, too. Remember he’s the guy that a climate scientist threatened to freeze out of further communications a year or so ago. I imagine someone yelled at his editor, who yelled at him. As a lukewarmer, I can say it straight–a lotta you (sadly not all) are smarter than the guys hanging out on the AGW sites. Waddya want? Validation from everyone? WOW, did you read that study! I have issues with a study that tells people they’re wrong for not believing in global warming and then using that to say that skeptics know less than warmists (mainly Q4, Q15, but I also have issue with Q1, one line from each of Q10, Q13, and Q26 (they say “contribute to global warming” not “increases CO2”, same thing with Q27). At this point I stopped reading but I’m sure that many of the future questions are just as bad). Q22a. If we were to stop burning fossil fuels today, the amount of carbon dioxide in the atmosphere would decrease almost immediately (false). I guess if we had no fossil fuels we’d quickly burn every tree on the planet, but still. In climatology, no modicum of honesty goes unpunished (and/or unhidden). For some reason I had always thought that people at Yale were supposed to be a little smarter than the average bear. But now, it would appear not to be so. Doesn’t that strike anyone as being a little odd? What the writers are, in effect, saying is that “If you believe, as WE do, that global warming is real and caused by human activity, then you are smart. If you don’t believe as we do then you are just plain dumb.” The writers are presupposing that global warming is real and that it is caused by human activity. If there is no global warming then the Dismissive are the smart ones (i.e. have a better undestanding of how the climate system works). Similarly, if there is global warming but it is just part of natural cyles, then the Dismissive would still be the better informed. They are simply making a circular argument. Global warming is real because smart people agree that it is real. And they are smart because they believe in global warming. Wouldn’t you expect a little better from an Ivy League college? Another Chinese proverb is applicable here: “For every mountain, there is one higher”. Certainly Revkin doesn’t stand atop the highest mountain, at least from my vantage point. And I can’t even see Gore, Mann, Hansen, and a crowd of others way off down in the valley somewhere. Do you think they’re lost? What exactly are you all about? Did you find those pictures yet that show coal trucks caused the traffic jams in China? If you click through to the report it’s interesting to see that those classified as most concerned about AGW (called Alarmed in the report) are the least knowledgeable about AGW. Very telling observation, chip, and worth highlighting. With this level of misconception (more extensive than your comment notes) I do not think it possible to have a real debate in the (American in this case) community. This belief error would be an excellent target for those wishing to see the reality of the whole AGW debate opened up to common sense and scientific fact; rather than ignorant fear and flight. Actually; I am quite stunned such ignorance of a matter of major import to the world exists. Common Misconceptions :Many Americans confuse climate change and the hole in the ozone layer. I think the term “luke-warmer” is rather a bad one to begin with. I understand the distinction between an alarmist and a luke-warmer, but to be honest, almost every sceptic believes CO2 does warm the planet to some extent. The difference between a sceptic and luke-warmer is simply put: how much? In any regard, I think anyone who studies the science to a certain extent comes to the same conclusion that the effects of CO2 are over-stated and that just because we can not explain the warming does not mean its not natural until proven otherwise. Anything past that is just a gut feeling or an educated guess. As a sceptic I appreciate that my guess of roughly 0.1C of “human-caused” warming is probably nothing more then that. When I say human-caused I also include land-use changes which at this point I believe has a larger impact then a trace gas…but I digress. I do realize CO2 is a greenhouse gas and that undoubtably humans are influencing this to some extent. But no study can even come close to figuring out this within what I would call comfortable margins without resorting to wild guesses (as they are called educated I would disagree). The problem with the alarmist position to begin with is that most of us sceptics started out as alarmists and moved into the luke-warm category or the sceptic camp due to self-education in this field. To Tom Fuller: No, I do not need validation, its a simple statement of fact that if he had left it up we would have not cared. The entire process of disappearing previously (wrong) predictions and other shannanigans means that anything they do is rightly so put under a microscope. This unfortunatly tends to effect work done by luke-warmers as well, which I do concede are also rather educated on this process…..but that is the price to pay to have alarmists screaming and sounding shrill everyday of the week. It might be wrong, but its what we have been reduced to as a society. There is no easy solution to any problem in society, and I think the luke-warmist position so to speak is much stronger and more backed-up then the catastrophic position of the alarmist, but the problem I have seen from anytime I try to dialogue with a luke-warmer is that they are stuck in a similar vein of group-think. I don’t say this as an insult, I have a lot of respect for the amount of information most luke-warmers are aware of, but I don’t think they traditionally ask the correct questions and do make assumptions. They do ask questions about solar effects to some extent, but they are more (and I should add rightly so) after cloud effects on CO2. But the fundamental problems with the theory are also not asked by luke-warmers. If AGW was happening on the Earth (besides the simple greenhouse component of CO2 as in the forcing) we would have seen warming oceans and a very distinct troposphere hot spot in addition to not having 15 years of either very little warming or no warming depending on how you read the last 15 years of data. The absense of either points towards either VERY weak feedbacks or even negative feedbacks in our actual atmosphere. I have also not seen good answers to the questions about the oceans and their effect on CO2 concentrations. Even the most fundamental question is not answered there to any extent, and the amount of sureness that goes with it is rather in my mind bad. Scientists should be sceptical of any theory that never validated the null hypothesis in the first place. Its actually possible that the CO2 component is negative after feedbacks. That in itself should point to a rather direct question: since it appears that in the past CO2 increases after temperature increases, is this possibly what we are seeing? If that is not the case, what effect is putting long-sequestered CO2 into the atmosphere actually going to have? We all know that the IPCC says 100 years for CO2’s life in the atmosphere, but most work points towards a half-life of around 9-15 years depending on the study. The 100 years comes from the theory that the atmosphere is saturated with too much carbon dioxide and that natural processes can not cope with the extra CO2 that was in the past sequestered. This is rather glossed over without much study. How do the scientists know that the plant-life will not adapt and eventually sequester more by themselves? Its just as good of a theory as stating that CO2 will start residing in the atmosphere longer with no proof of that matter. Until we are more sure on this to begin with, measuring warming from even a simple doubling of CO2 which tends to make the math easier is still fraught with uncertainty since for one we are not even sure the dog is waging the tail so to speak…and even if the dog is waging the tail to some extent, could it be possible that the tail is also waging the dog to an extent? These questions go towards the heart of the matter. Hahahahahaha! This has gotta be the dumbest study ever done. It’s almost as if the authors don’t understand what the meaning of the labels “Alarmed”, “Concerned”, Cautious”, “Disengaged”, “Doubtful” and “Dismissive” mean. Love it! (Apart from the small x y swap) Logic is a wonderful tool. “You can’t “unpublish” ink on paper….” Unless Sandy Berger removes it from the archives in his socks. China coal truck traffic jam covered in the links. The real problem is that Revkin wrote the statement in the first place. As pointed out in the study there were *some* questions where the “dismissive” had a better score, but also many where they did much worse, even issues that tend to be repeated a lot by the “skeptics” on blogs like this. For example “In the past, rising global temperatures have caused carbon dioxide levels in the atmosphere to increase”. How many times haven’t “skeptics” brought up this point in relation to the correlation between CO2 and temperature in ice cores, claiming that this is just because CO2 follows the temperature, not that it changes it. Yet, most of those dismissive of AGW believe this statement to be false and the alarmed do much better. Looking at questions about past and current levels of CO2 in the atmosphere the alarmed also did considerably better, to pick some questions that are fairly neutral and agreed on by the better informed on both sides of the camp. The dismissive also are more prone to a logical error like agreeing with the statement “The Earth’s climate has changed naturally in the past, therefore humans are not the cause of global warming”, a statement that you don’t need to know anything about the climate to realize is false. It seems to me that people on both sides know a lot less than they think and guess based on their general belief about AGW, which sometimes favor the alarmed and sometimes the dismissive. The alarmed get the right answer that a temperature increase in the oceans will rise sea level, but the wrong one when they think melting sea ice in the Arctic will do it as well, and vice versa for the dismissive. It is not the act, but the cover up. Every time there is a cover up related to needing to maintain a pro-AGW stance, including toning down praise of sceptics as Andy did now, it is going to be noticed and criticised. Proponents of AGW have lost the benefit of doubt to be afforded to any of their actions, due to numerous transgressions. Revkin is a “mood” based journalist. What he lacks in intelligence he makes up for in following the crowd mentality. With very little scientific understanding he depends on which way an argument is being won or lost at the moment. He “adjusts” accordingly. What you say is rubbish. This is not at all a circular argument, unless you don’t know that two independent polls of scientists who regularly publish papers in climatology have shown that 97% of those scientists believe that global warming is happening. For someone who is not an expert, and not capable of sorting out the evidence for himself, accepting the near unanimous opinion of experts is valid. Ignoring the opinions of experts in a field when they are in agreement is ignorant. I’ve removed a line I’d tacked on here that gave too simplistic a summary of the Six Amercias [sic] study. Whether one agrees or disagrees with total removal of a line or leaving it on the page with a line drawn through it, and a disclaimer is an open question. Doing the latter tends to create more personal trust of the blogger by the public. That is distinct from the question, did the line give too simplistic a summary of the Six Americas study? If you read the report the answer is yes. Some skeptics who disagree with the conclusions of the report may believe that the original sentence Revkin had is correct, but it certainly doesn’t provide a summary of the report. In fact the “alarmists” got overall the best grade on the factual questions asked in the survey, according to the report, but it says the truth is more complicated than that. So, whilst there are areas where, to use Anthony’s phrase, “the Doubtful and Dissmissive [skeptics of man-made global warming]” have equal, or even better knowledge, there are far more where it is poorer. Is Gary Neville moonlighting as a warmist? Thanks, Antonia (from an Australian). Mr Revkin has always been fair with my posts and answered me directly whenever I asked him a question on his blog site. In this case, he made a change to his blog after realizing, for whatever reason, that a link did not add to discussion. He then annotated the blog to record the editing. Especially compared to say, Tamino’s or RC’s approach to truthiness. I have little sympathy or regard for people like Revkin who think that it’s morally acceptable to be devious and expunge their own statements that they view with hindsight and regret for whatever reason. .Morally grown-up people accept that saying stuff one might regret later is a part of life. It’s a bit of a worry that whoever wrote that can’t spell “dismissive”. I am agreeing with you there, there are a lot of logical errors across the board, from both sides. I think a lot of people seem to forget that we (sceptics and warmist) are not a majority in the population. Most of the people i speak with talk more about lybia or something simular then about global warming. Nice summary. I wonder what the results would be if the study’s authors hadn’t begged the question and stuck to ONLY facts that were agreed upon and/or indisputable. Where can I find the deconstruction of that Six Americas [sic] study Willis is (I hope) writing? 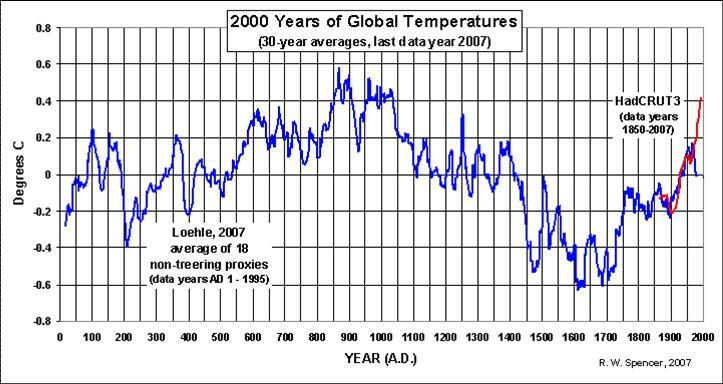 Are you claiming that the temperature increase did not precede the CO2 rise? The analysis of those ice cores clearly showed that the temps lead the CO2 — but the argument I’ve always heard from the alarmists is that “something” started the warming, and then once it released the CO2, that took over and amplified the warming, until “something” stopped it and started a cooling cycle. This contradicts the alarmists’ position that CO2 is the main climate driver: if the “something” that started the warming wasn’t CO2, what was it? If the CO2 is supposedly the main driver, what was the “something” that overrode it and started to a cooling cycle? One can’t have it both ways — either the CO2 is the driver, which means that the Earth should have gone greenhouse max by now, or it it isn’t, which is why the Earth has not. 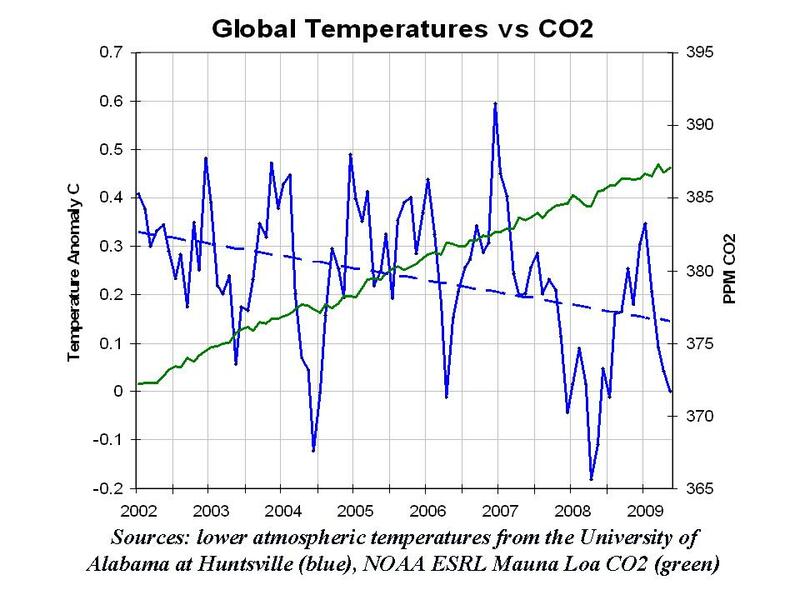 Increased CO2 = increased global temps could very well be a post hoc fallacy — and appears to be so, given the flat, or even slightly decreasing global temps since 1998. If CO2 is the main driver, how can something else be overriding it these past 13 years? If CO2 is the main driver, how is it that global temps have been rising since the end of the Little Ice Age, long before humans were pumping CO2 into the atmosphere? What exactly is wrong with replacing a paraphrase with the exact quotes? Everyone is acting like Revkin has removed some gigantic truth and replaced it with propaganda. Yes, that has happened elsewhere, and we’ve seen it in the Climategate emails. Kudos to everyone that has had a hand in dissecting those indictments of the “scientists” who wrote them. That was and is a despicable, non scientific process. But simply deciding your paraphrase was a tad simplistic, and replacing it with the real quote? That’s not a scandal, that’s nothing. This contradicts the alarmists’ position that CO2 is the main climate driver: if the “something” that started the warming wasn’t CO2, what was it? If the CO2 is supposedly the main driver, what was the “something” that overrode it and started to a cooling cycle? Main doesn’t mean exclusive. Hope that solves that little dilemma for you. For Andy: now if you’d only hired different sociologists to dissect your mammoth AGU thread. er, Ben, it’s a bit inelegant of me to put the time wrong for your comment. At 10:30 PM last night, Ben from the Show Me State, has shown us his cri de coeur, one that ought to grace Andy Revkin’s Dot Earth blog. I don’t agree with everything single thing he says, but the sentiment, oh, I’d defend ’til the end of time the hope of man springing in that heart. That echo chamber those guys are in must be really loud if it is successfully drowning out everyone outside of it pointing out their own hypocrisy. I’m thinking we need to revert to sign-language to get their attention. Yikes, it was 10:40 PM! How mundane does error get? You think constructing a straw man fallacy demonstrates someone else’s error? The physical properties of CO² have been known for over a hundred years and the greenhouse effect was predicted in the 19th century as a consequence of this. In the 1950’s we started to measure CO² levels in the atmosphere and found they were rising. Isotopic analysis showed us that these changes were consistent with fossil fuel consumption. Later observations showed changes in LW radiation being emitted into space and downward backscatter radiation consistent with CO²’s absorption bands. This explained an already observed imbalance in the planets energy budget. At the same time increasing numbers of metrics were showing a change in the planets climate; temperature, ice mass budget, sea level, migration patterns, tree lines, etc, all showed a clear warming trend. Of course correlation is not causation, but what we now have is a known mechanism that has a high likelihood of causing the majority of the warming in the last 50 years. This is not a conclusion reached in the asinine way you suggest, it has been achieved through over a century of scientific endeavour and to misrepresent it as you have is insulting to say the least. Science being science, we must always accept that there might be a better explanation for what has been observed, but none of the known natural causes explain the current trend and where others will invoke unknown natural causes I turn to Occam: the argument that requires the most new assumptions will tend to be wrong. I would say that the clipped paragraph is not a fair summary of the document. The second paragraph of the Executive Summary (which I can’t quote because cut ‘n paste from that PDF results in gibberish) clearly shows that the alarmed and concerned are better informed, but that no group smothers itself in laurels when it comes to knowledge about climate change. It’s clear that logical thinking isn’t Mr MacDonald’s strong suit. The rising temperature trend line since the LIA is essentially unchanged over the past 50 years compared with the previous 150 years, therefore the ≈40% rise in CO2 is inconsequential, as it makes no difference to the naturally rising trend. MacDonald can call that reasoning ‘asinine,’ but that’s a typical response when the alarmist crowd is unable to adequately respond to the reality of the situation: CO2 has no measurable effect on temperature, and it is not the cause of the slowly rising trend line. It may have a small effect, but the effect is so insignificant that it can be completely disregarded for all practical purposes. In effect, in the space of a few paragraphs, you have falsified your own understanding of what global warming is. I suggest a better educator in future. I recall we discussed Tripati’s study here, some time ago. Extremely Good News! No destruction of life on earth. In fact, conditions observed in that study (allegedly what rising CO2 promises for our future) led, in the long run, to… our present climate (whatever it may be). What? You mean sceptics are not crazed lunatics or conspiracy theorists? We have neither a monetary agenda nor damaged grey matter? I am so confused! I don’t know where to belong. Ahhh… The cognitive dissonance! I need to find an environmentalist to disparage me and return me to my place of lowly existence, ASAP! As ever, you are wrong. The rate of warming has increased from 0.2°C in the hundred years to 1960 to more than 0.7°C in the hundred years to 2010. I have plotted trends for the decades between 1960 and 1970 to show that this is persistent, decade on dacade rise in the rate of warming and not the result of simply cherry picking two periods that suit my own belief. Most people and scientists agree global warming is happening, not all agree that it is mainly anthropogenic in nature. JamesS, during the ice age cycles the primary driver is generally considered to be orbital variations that cause snow to remain over the summer in the northern hemisphere. Snow reflects sunlight which causes cooling. CO2 acts as an amplifier and to synchronize glaciation of the hemispheres. But that was then, today our emissions of CO2 are the primary driver. There is no reason to assume that climate change is always caused in the same way. As Kevin MacDonald has already pointed out, your “logical fallacy” is itself a fallacy. It would have been relevant if we first noted the warming and then tried to find a cause, but that’s not how it happened. Global warming is a prediction based on understanding on how the climate works which was later confirmed by observations. We were at war with East Asia. We had always been at war with East Asia. I don’t know what to make of the “Six Americas” concept introduced in the original *) Yale/Mason 2009 study that the authors used for the classification of their sample. All my friends know that last time my kids did a social science global warming study they counted exactly 9 (Nine) Americas. Or were the authors just distancing themselves from John Edwards and his basic Two Americas thesis? I abhor such uncertainty. This is exact science we are talking about here. Good one Andrew. The bible also does not mention 2012 even once. So it gets points just for that! The authors treat the statement that renewable energy sources are an important solution to global warming as a fact instead of the opinion it is. Therefore, the Doubtful and Dismissive, who probably know more about the limitations of renewable energy sources than the Alarmed, appear to be idiots. •	50% of the Dismissive and 57% of the Doubtful understand that carbon dioxide traps heat from the Earth’s surface, compared to 59% of the Alarmed, and 45% of the Concerned. I agree with Dolci, Yale should be embarrassed by this report. 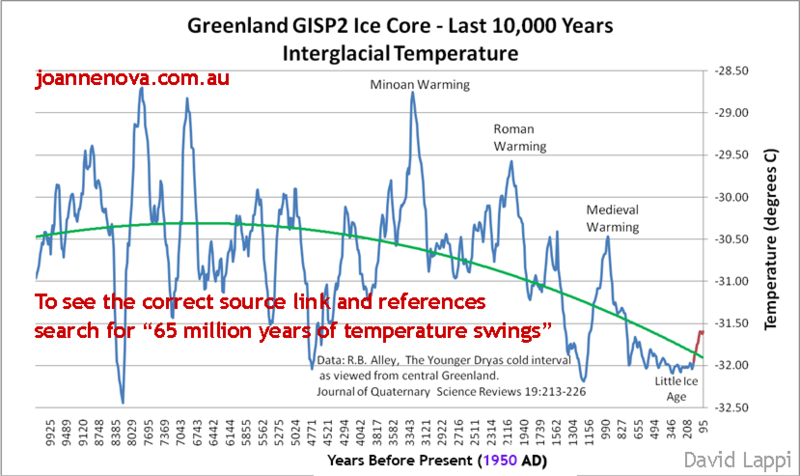 Kevin MacDonald and Thomas should study this graph of temps over the past 10,000 years, derived from the GISP2 ice core data, to understand why the current gentle warming trend is neither unprecedented nor dangerous. “Things were different then” is not a scientific hypothesis, either. lol, that like the original press release from U of Delaware regarding the huge iceberg that broke off of the Petermann glacier on August 5/6 2010. You can’t find the original version of the story anywhere. I’ve tried all the cach sites and turned up blanks. In his original statements, Dr Andreas Muenchow, lead researcher said things such as: This is normal for this glacier. The reason this piece is so big is because it has been so long since the last piece broke off. The Petermann glacier actually shows no sign of shrinking over the past 100 years. etc. They scrubbed all of that stuff so that the page seems more alarming now. I wish I had directly quoted the original somewhere, but I just paraphrased it, so I don’t have any exact quotes. Oh well. Shame on me for not grabbing it, and shame on U of Del for the gratuitous editorial bias. I think the original version was up for about a week, until I commented about it on Physorg and then the story magically changed, along with every site that I can find who quoted it. Dr. Andreas Muenchow made some statements independently on more than one occasion stating that the event certainly wasn’t linked to global warming, but on places like NPR where they quote him, they leave that part out. lol. Kevin MacDonald probably can’t understand why the planet contradicts his belief system. If you think my beliefs preclude interannual variability you are even more ignorant that I thought. The slow, steady rise since the LIA can not be due to CO2, because despite a major 40% increase in that harmless, beneficial trace gas, there has been no corresponding or unusual temperature rise. As I have already shown, there has not been a “slow, steady rise since the LIA”, the centennial rate of warming has increased by half a degree in the last 50 years. The graphics you keep linking to are useless for this purpose, a single OLS fit over the full period can tell us nothing about changing rates within that period. You should study the definition of the word global, derived from the Latin globus, to understand why a single proxy from one location tells us next to nothing about the current warming trend. “Sorry, I was just regurgitating somebody else’s idiot meme” is not a scientific hypotheses, either. Alarmists always talk about the sensitivity of climate to CO2 concentrations when the temperature is rising, but they ignore those same CO2 concentrations when the temperature is falling. Either CO2 is the main driver, or it isn’t. Later observations showed changes in LW radiation being emitted into space and downward backscatter radiation consistent with CO²’s absorption bands. This explained an already observed imbalance in the planets energy budget. The planet’s energy budget as described in Kiehl and Trenberth 1997 (or some other similar model/diagram) requires feedback to function. If GHGs are at work, then they do their thing by absorbing energy. The atmosphere warms when this happens. Even if you ignore the tropical hotspot, the KT 97 feedback model requires the atmosphere to warm faster than the surface. In comparisons, the atmosphere appears to be warming at a slightly slower pace than the surface. By Occam’s razor it means in the current scenario that the surface is warming the atmosphere instead of the atmosphere warming the surface. “For every complex problem, there is a solution that is simple, neat, and wrong.” –H.L.Mencken. In the pre-1989 times of the Cold War Kremlinologists used to inspect photos of the lineup of the ususal suspects on the Kremlin wall balcony for gaping holes. Analog photoshopping did produce some amazing results but could never entirely avoid those taletelling blurred edges around the spot where the deleted (“eliminated”, if you will) person had been standing before he got sacked. Hmmmm….Arctic sea ice isn’t melting as expected, I’d suggest that WUWT readers keep a close eye on this site to see if anything gets “adjusted” suddenly! Rather inconvenient truth for some, sea ice extent is now with two S.D. of the average, and growing. Well Andy looks like he has gone a little bush since he changed jobs; even to the point of looking seedy. i can picture him fitting in at Berserkeley, ot perhaps UC Santa Cruz. As you say Anthony, he used to be a rather fair minded person; even if misguided. But he was always straight with me too, so I will withold criticism, and just say: Andy , wha’ happened to you ? So you’re saying the ice cores referred to above don’t contain a significant temperature signature for a long period of time? Do you have something better on a “global” scale? I submit they’re far better than a bunch of trees in Yamal (or I should narrow that down to a specific “tree”), or the fudged data Phil Jones refuses to find, or the hair-pulling climate rants of Pachuri et al because nobody takes his UN body seriously anymore due to faulty/politicized science. Just checking. I’d rather have one decent data string than junk science anyday. MacDonald has shown nothing of the sort. He simply cherry-picked. To avoid cherry-picking, let’s look at the last 10,000 years; the entire Holocene, which followed the last great stadial. In fact, let’s go back even farther: 50,000 years back. Seen in perspective, it is obvious to any but the most cognitive dissonance-afflicted alarmist that the extremely *mild* 0.7°C natural warming cycle over the past century is insignificant, and that the great danger is falling temperatures. The fact that the minor rise in temperature was [until recently] coincidental with the rise in harmless, beneficial CO2 gave the warmist crowd the ammunition to trumpet to a scientifically illiterate population the “carbon” canard that human emissions are causing runaway global warming. They are not. Global temperatures have declined recently, while CO2 continues to rise. If CO2 had any significant effect on temperature, that could not happen. The real world is falsifying the CAGW conjecture. So who are we gonna believe? MacDonald? Or planet earth? Also, I think many find it remarkable that not only did they “disappear” all things that disagreed with their (current, up to the moment) orthodoxy, but that the government pushed propaganda through the view screens, with the news anchors encouraging everyone to get red in the faced, shrieking livid over their pet political talking points of the day (sounds like it could be any of CNN, MSNBC, or Fox). The Winston Smitch Archives. The tube stops here. So you’re saying the ice cores referred to above don’t contain a significant temperature signature for a long period of time? No, I made no mention of the timescale mentioning only the very limited spatial resolution and can’t imagine how a rational person could interpret that point this poorly. Do you have something better on a “global” scale? Instead of cherry picking tiny bits of data that support my preconceptions, I prefer to refer to multi-proxy data sets. The hallmark of any true skeptic is looking at all the data. My guess is that “The Bible” has changed far less since the Fourth century than Wikipedia has changed since the Fourth of this month. Of course we’re talking apples and oranges here. Do keep up, that particular cherry has already been popped. A single proxy, from a single geographic location tells as almost nothing about the global trend. Okay, this “study” is idiotic and designed to produce a desired result. Riddle me this: I believe the earth has warmed since the LIA and that all other things held constant rising CO2 levels will result in some warming. And even considering feedbacks, that are a big unknown, rising CO2 should result in some warming. I also believe that there is mounting evidence that these feedbacks are likely negative and any warming due to CO2 will be harmless to beneficial for life on earth. Okay so what am I……….Alarmed, Concerned, Cautious, Disengaged, Doubtful, or Dismissive. The “study” also assumes its own answers are correct. If you believe that global warming is mostly due to humans then you are right……….otherwise you are wrong. There are other examples of this in the report under the heading of “Understanding of Climate Change” on page 2. This study is a disgrace. Perhaps the most telling revelation in the Executive Summary is that 63% of the alarmed and 49% of the concerned believe the ozone hole contributes to global warming……many of those most concerned don’t even understand environmental science in general let alone global warming science. Show me a study that asks questions about the science…this is useless. And you’ve conveniently ignored someone else’s mention of the most influential tree in the world. I might include Mann’s stripbark pines as another example. 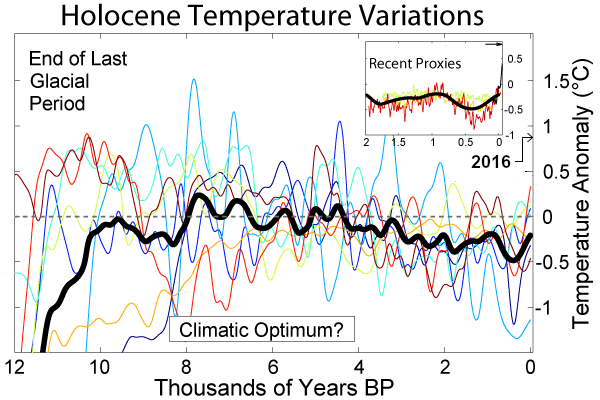 Without these questionable proxies, there is no hockey stick, no unprecedented modern temperatures. And of course, we have the fact that the concepts of a global temperature or GT anomaly are meaningless. In spite of eadler’s vituperative and personal attack I will endeavor to reply in a civilized manner. First, it is a circular argument. The fact that the premise may ultimately be proven to be true does not alter the fact that what Yale presented in the question/response I identified is a circular argument, and therefore, the argument itself can not be relied upon to prove anything. Likewise, it doesn’t disprove anything, it is just nonsensical, and, as I said, one would expect better from Yale. Second, consensus proves nothing. Moreover, there are big problems with your claim that “two independent polls of scientists who regularly publish papers in climatology have shown that 97% of those scientists believe that global warming is happening.” First, who conducted these polls and whom was polled? Second, the climategate emails clearly show that “scientists who regularly publish papers on climatology” is hardly a fair sampling, since the “climate scientists” have acted quite vigorously to prevent non-believers from publishing. Third, your numbers are nonsense. Check out the Global Warming Petition Project(http://www.petitionproject.org/), which shows that over 31,000 scientist have rejected the alarmist view of global warming. eadler goes on “For someone who is not an expert…”. Well, how do you know I am not an expert? Have you seen my credentials? How do you know I didn’t stay at a Holiday Inn Express last night? Instead of calling names and insulting me why don’t you challenge my arguments with facts and logic. And you’ve conveniently ignored someone else’s mention of the most influential tree in the world. Yeah, that was RockyRoad, I felt it more important to address that posters inability to differentiate between geography and time. You should be addressing this to JamesS and Smokey, they’re the ones that brought it up. Using completely unreliable proxies like treemometers and contrived sources like Wikipedia result in failed arguments. Want tree rings correlated to temperature? No problem. 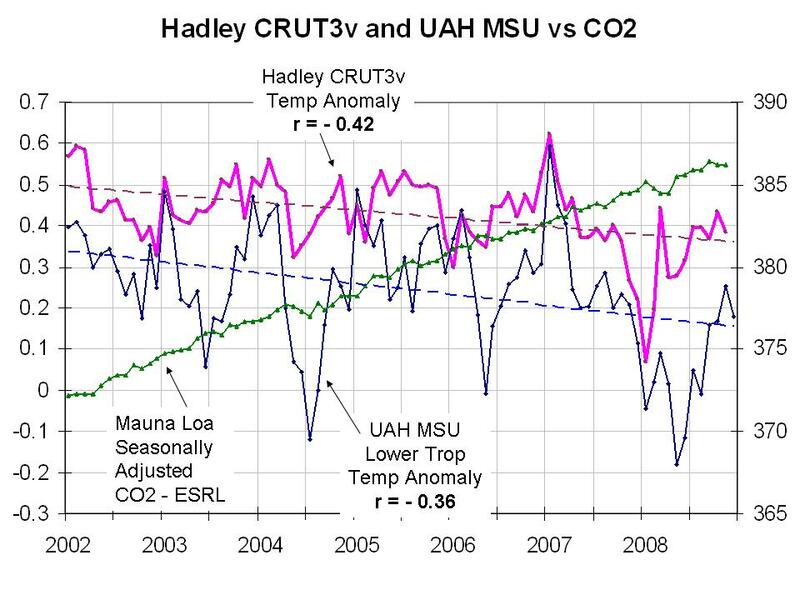 Want tree rings correlated to CO2? No problem. It’s all alarmist horse manure, and it proves nothing at all. It’s just wild-eyed arm waving. Uneducated, uncredentialed amateurs like Kevin MacDonald don’t even understand the scientific method, much less the climate null hypothesis, so it’s no wonder they’re so easily bamboozled by climate charlatans. The Kool Aid is tasty, and that’s all that matters. Check out the Global Warming Petition Project(http://www.petitionproject.org/), which shows that over 31,000 scientist have rejected the alarmist view of global warming. Here is a list of scientists who reject HIV as the cause of AIDS and here is one where scientists reject evolution by natural selection. What are we proving? how do you know I am not an expert? Is it because experts don’t make their points by publishing meaningless lists of names? Running out of cherries to pick, so moving on to the ad homs Smokey? I attacked your argument, I didn’t attack you personally. I did not evaluate your expertise in climate science or anything else. My argument was that people who don’t have sufficient personal expertise in climate science would be smart to accept the consensus of climate scientists when it comes to taking a position on AGW. If one doesn’t have the knowledge of a subject, it is dangerous to overestimate your expertise if you come to a conclusion that is opposite to what 97% of the experts say is correct. A graduate of any good college would consider such behavior as intelligent. So the right answers to the quiz were based on what climate scientists would consider the right answer. This is what is normally done in an academic institution. The Oregon global warming petition was sent out with a document that was designed to fool people into thinking that the National Academy of Science published it. A small proportion of people who signed it were scientists, and many have taken back their endorsements. It is not a random sample of scientists of any kind. Nobody was tortured to get the results. Seventy nine out of the 3146 earth scientists were categorized according to the quote you provided. In my opinion these are real climate scientists. Furthermore Peter Doran, who did the poll with his graduate student, does have a PHD. Classic ‘Animal Farm’ sleight of hand..
Yeah, thanks. I saw that piece. It was obviously the editor of the U Del web site or some department admin person that modified Muenchow’s original statements. Muenchow is clearly not an alarmist in this case. Kevin MacDonald, let’s back out of the ad hominems and insults and find our common ground. First, do you accept the occurrence of the Medieval Warm Period (MWP) and the Little Ice (LIA) age as more than regional events limited to Europe? Second, I agree that the Earth has been warming since the end of the LIA. Third, do you view this warming trend as unprecedented in Earth’s history? Fourth, do you agree that the Vostok ice core data demonstrates that the CO2 rise followed the temperature rise by approximately 800 years? Finally, given that the temperature rise since the LIA began before the atmospheric CO2 had been increased dramatically by human activities, how do you account for that given what you feel is known about all possible warming mechanisms? The ice cores from multiple locations in both Greenland and Antarctica show similar trends, and along with speleothem, sediments, and other paleoclimate indicators from around the globe prove that the current global warming is neither unprecedented nor exceptional. Yes, but on current evidence the regional shifts appear to be asynchronous and I would not agree that either could be described as a global change on the scale we are seeing today. Yes, but my concern is that warming, as I have already shown, has accelerated in the last 50 years. No, but I think it unlikely that there has been such a dramatic shift in human history. Given the asychronous nature of the LIA I think a combination of solar activity and internal variations is most likely. I’ll grant you this is a slightly more sophisticated cherry pick, but you have still failed to direct me to a multi proxy dataset that shows that the current warming is not exceptional. The current [very mild] warming is not exceptional. Here is a multi-proxy data set of 18 [non-tree ring] proxies showing that fact. Those pesky facts always seem to get in the way of the repeatedly debunked CAGW fantasy. Uh, Lohle had to correct paper in 2008 due to data handling errors, so referring to it as “fact” is a little strong. Regardless, even in the erroneous graph you linked to the warming of the last century is the most pronounced. Kevin MacDonald presumes to criticize an honest scientist for making a mistake, as if he himself is somehow faultless. But of course, we know that is not the case. Prof Loehle voluntarily fixed an inadvertent error. Isn’t that what the scientific method is all about? Throwing out everything that is shown to be wrong, and going with whatever is left standing? In fact, it turns out that 80% – 90% of all peer reviewed papers are eventually found to be in error one way or another. For exammple, Michael Mann’s MBH98 is a paper that was officially found to be completely in error by Nature, the journal in which it was originally published. Mann’s paper was found to be so flagrantly wrong that Nature was forced to issue a rare public Corrigendum – much more serious than a simple Addendum, which only indicates an unintentional mistake. Nature’s Corrigendum was published because Mann’s paper was, to put it charitably, deviously wrong. Thus, Mann’s debunked Hockey Stick in MBH98 can no longer be used by the UN/IPCC – much to that corrupt organization’s dismay. Mann’s Hokey Stick had a visual impact that all subsequent hockey stick charts lack. 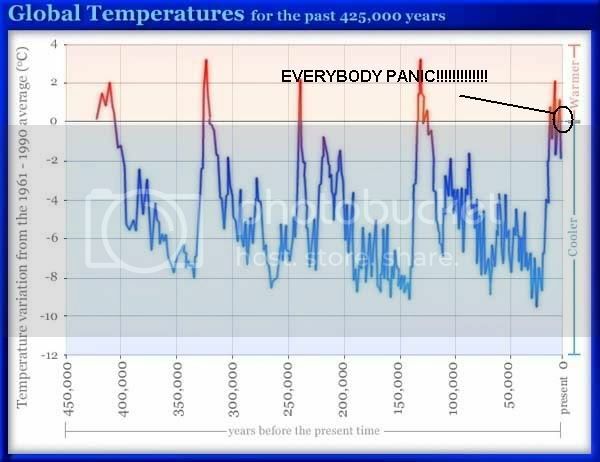 The IPCC absolutely loved Mann’s bogus chart. They would never have stopped using it, unless they were forced to. Which they were, by the Nature Corrigendum. That shows the reason that the alarmist contingent always refuses to abide by the scientific method. If they ever ‘opened the books’ on their data and methods, all of their work would be debunked, just like their Hokey Stick was debunked. That’s a fact, Jack. CAGW is based entirely on smoke and mirrors. If the demonization of “carbon” was based on verifiable facts, then there would be no credible reason to avoid transparency, as the Mann-led climate clique routinely does. So they need to open their books, and show all the raw data, and their manipulations of it, and answer all skeptical questions regarding their methodologies, code and metadata – and let the chips fall where they may. That is how the scientific method works. Anything less is climate charlatanism. This is an outright lie Smokey, you must be getting more desperate. I did not criticize Loehle, I criticized you for using a graphic from a flawed study. You keep calling me a liar, when all I did was direct you to a multi-proxy data set composed of eighteen different proxies from peer reviewed studies. That data set shows clearly that the current mild, natural warming cycle is not unusual, unprecedented, or out of the ordinary. I understand that your ego is invested in the repeatedly falsified belief in catastrophic AGW, so when facts are presented your response is to label me “desperate.” As if. Instead of trying to claim that I am ‘desperate’ [which I am clearly not, I am enjoying destroying your evidence-free arguments], try to present us with falsifications of those 18 separate proxies – if you can. Take your time, I’ll wait here. While you’re scratching your head, take a look at this chart, and try to figure out how to convince us it’s time to panic. Run along to skeptical pseudo-science or realclimate if you need some new talking points. I don’t keep calling you a liar, I called you a liar once and only then because you lied: I didn’t, as you fallaciously claimed, criticise Loehle, I pointed out that the graphic you referred to as “fact” had since been altered because of data handling errors. That data set stops in 1935, it doesn’t show the current warming at all, here it is with the rest of the 20th added on. You’ll note that the warming from this latter period is not repeated anywhere else in Loehle’s reconstruction making it unusual, unprecedented and out of the ordinary. 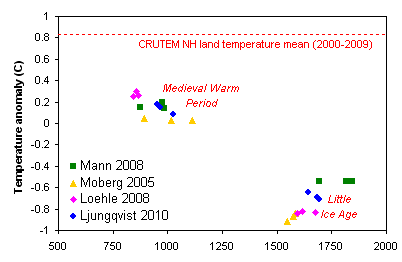 Further, here is how Loehle’s reconstruction compares with some other recent reconstructions and here is how the warmest decades in those reconstructions compare to the last decade. That Skeptical Pseudo-science chart is totally bogus. It attempts to eliminate the MWP and LIA just like the debunked Mann Hokey Stick chart did. Don’t insult our superior inteligence with that kind of fantasy invention. 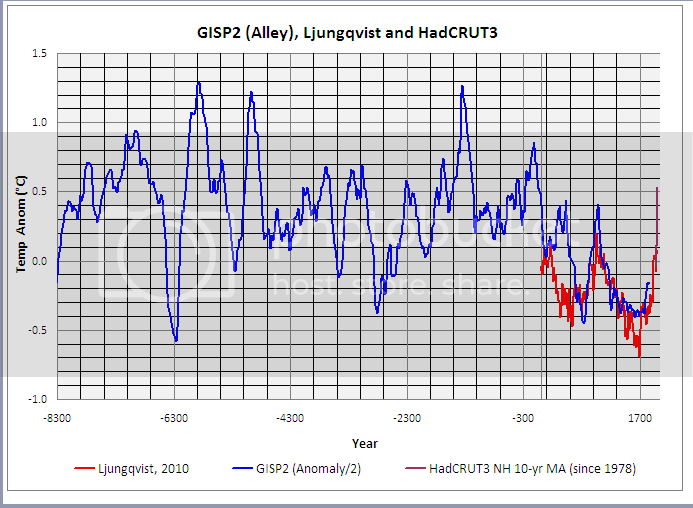 And Ljungqvist’s chart goes right up into the 2000’s, although it’s hard to see at this scale. 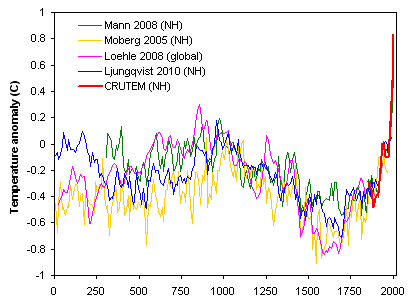 And current temperatures are still far below the natural warming cycles during the Holocene. The alarmist crowd got it exactly backward. The major concern is global cooling. And that is just what has been happening for the past decade, as harmless, beneficial CO2 continues rising, while the planet cools, thus falsifying the CO2=CAGW conjecture. It’s hard for the alarmist contingent to accept the planet’s verdict, but the fact is that CO2 causes negligible warming – and any warming is a good thing. But that fact won’t stop Algore’s red faced, spittle-flecked arm wavers from panicking; they suffer from the Black Cat Fallacy: they’re certain that there is a black cat in their dark room at midnight. But when the lights are turned on… there is no cat. And there never was. They’re just as certain that “carbon” will cause runaway global warming and climate catastrophe. It won’t. The planet is showing us clearly that CO2 is not a problem. And the planet doesn’t lie. That Skeptical Pseudo-science chart is totally bogus. It attempts to eliminate the MWP and LIA just like the debunked Mann Hokey Stick chart did. Don’t insult our superior inteligence with that kind of fantasy invention. 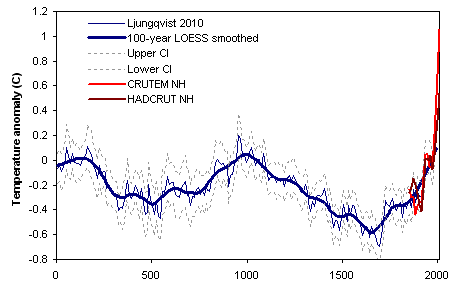 And Ljungqvist’s chart goes right up into the 2000′s, although it’s hard to see at this scale. 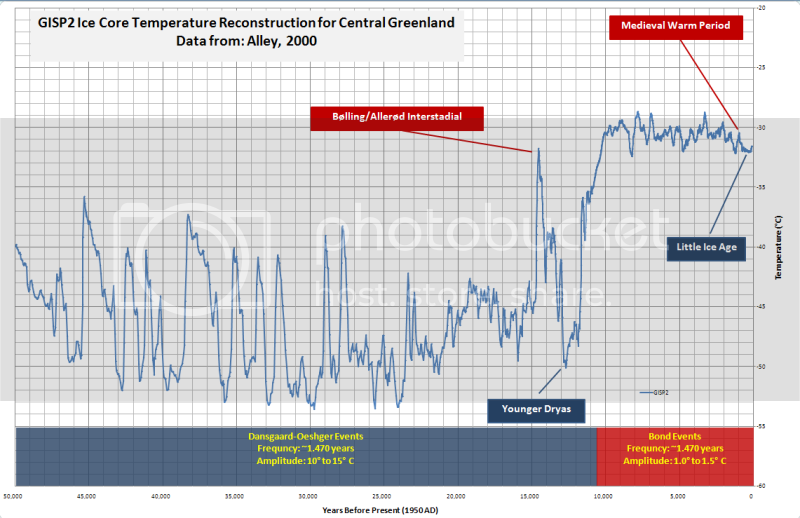 The “Skeptical Pseudo-science chart” includes Ljungqyist’s chart which clearly shows that the current warming is unprecedented in the modern era. Back to the GISP2 cherry pick, and you claimed you weren’t desperate. The planet has been warming for the last decade. Please stop posting those bogus Skeptical Pseudo-Science hokey stick charts. They are exactly the same kind of debunked charts that Michael Mann’s hokey stick chart fabricated, and which Nature was subsequently forced to retract in its Corrigendum. They are a deliberately false misrepresentation of reality that your cartoonist’s pseudo-science blog spoon feeds to the gullible. Basing your argument on a debunked hokey stick chart fails. The chart you posted is faked. It is completely fabricated, and does not reflect reality. And the aptly named “WFT” site is every cherrypicker’s dream. Forget the fact that the globe is cooling, it’s much more fun to panic over natural climate cycles. Finally, there is zero credible evidence that the rise in CO2 has caused, or is causing, any global damage. That is an alarmist fantasy. 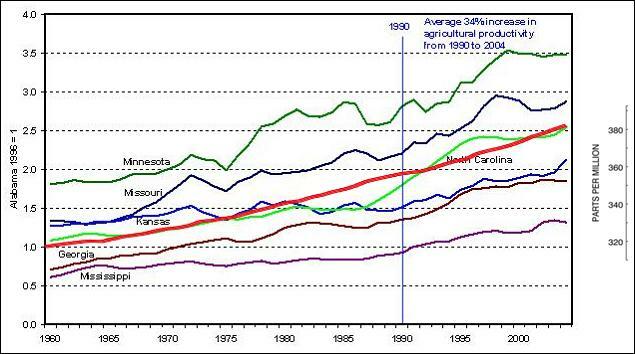 But there is plenty of solid evidence that increased CO2 results in increased agricultural production. Since the alarmist crowd is only happy when poor folks are starving, they don’t like the proven benefits of more free airborne fertilizer. You were the one that, approvingly, introduced Ljungqvis to the discussion, but now you’ve been shown it doesn’t say what you thought it did you dismiss it as “bogus Skeptical Pseudo-Science”. It’s as funny as it is pathetic and sad. Got any more studies you’re hilariously wrong about you’d like to link to? Dodging, weaving, and ignoring the central point doesn’t win the debate. I will concede that there is a “carbon” problem if you can provide testable, verifiable evidence of global damage from CO2. 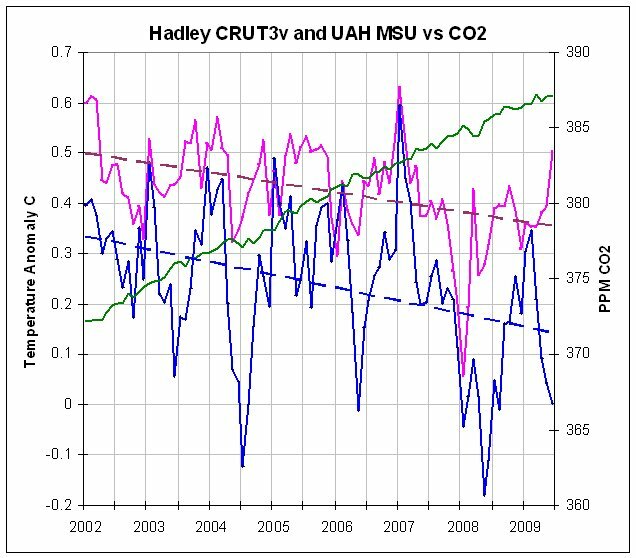 Provide the raw data source, and convincingly show us that CO2, specifically, is harming the planet. Because the rise in CO2 is the entire basis for the “carbon” scare. Nothing else matters. If CO2 is damaging the planet, then prove it per the scientific method. Complete transparency of all data, metadata, methodologies and code is required. With a proposed cost of many $trillions, nothing can be kept secret from the taxpaying public. Of course, if you can show convincing evidence that CO2 is causing global damage, you will be the first to be able to do so, and you will be on the short list for a [now discredited] Nobel prize. 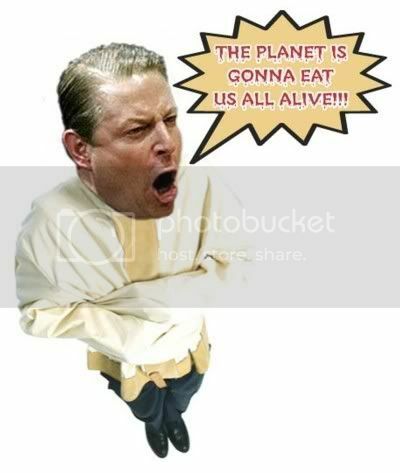 And you will be Algore’s hero! So show us that mythical global damage caused by CO2 — or be a standup guy and admit that CO2 is a harmless and beneficial minor trace gas. Everything else is just impotent arm-waving. A best fit of all Holocene reconstructions suggest it is likely that the current temperatures are the warmest for that period. In a move that you characterise as not desperate, you are now abandoning all of these claims, throwing down the straw gauntlet and asking me to prove a case that I never made. You have provided no evidence that shows anything other than natural climate variability. And the chart you copied from Skeptical Pseudo-Science is, as usual, flagrantly inaccurate. It is an overlay that purports to show a preposterous 1.4°C temperature rise, when the most widely accepted figure is half that. I suppose that is what passes for a replacement of Michael Mann’s oficially debunked hokey stick chart. And the WFT site is a cherrypicker’s dream; anything can be shown by picking specific parameters and years. 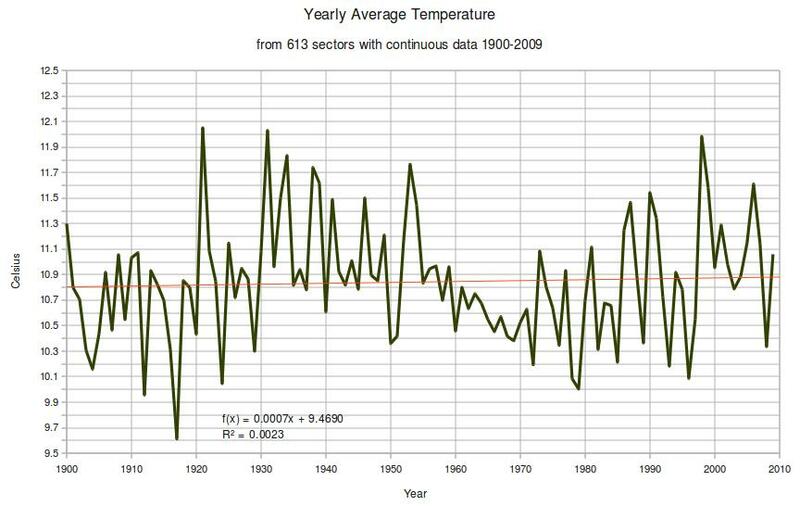 But when current temperatures are viewed, or satellite temperatures are recorded, no global warming is evident. You declined to pick up that “straw gauntlet” because it is the central argument in the entire debate. If current temperatures and trends are indistinguishable from natural variability [they are], and if CO2 causes no global damage or harm [it doesn’t], and if CO2 significantly increases agricultural production [it does], then the logical conclusion is inescapable: CO2 is harmless and beneficial. [/url] Hogan sneakers men. To forestall gravity shock, urine remedy before you run, really don’t quickly stop running along the way; run concluded and do not all at once was standing still, should continue being stress-free jogging, walking, and step by step transitionon track.